A surprising conversion, an unusual childhood, & an apologist’s apology. Can a loving God judge evil & hold people to account? Justine: Amy is not only a prolific speaker, she’s a writer as well. One of her recent books is called, Why trust the Bible? Amy: The Bible describes the real world as we know it. It has the ring of truth, this is not a sort of religious mythical bubble that we need to jump into, that only makes sense internally if we just close our minds to the real world that we experience. The Bible is trustworthy because it diagnoses the human condition that you and I experience. It speaks of it in real terms—with empathy about the darkness and violence of this world—and it introduces us to the God who’s entered this real world in the person of Jesus. So I think we can trust the Bible in those kind of existential terms. But secondly, historically it is my experience through studying the manuscript tradition—through studying the historical process of the transmission of the Bible—that this stands up to rigorous scrutiny. That the source material for the Bible is vast. That where there are differences between manuscripts, those differences are not covered over in English or other language translations. There’s an openness about the process of transmission and I think that makes it trustworthy. Justine: It’s also a book that you’ve seen has had an impact in some quite surprising places. I read that you went to Afghanistan when you were 19—you have all these wonderful stories in your biography—and you presented the Bible to someone in that circumstance didn’t you? Amy: Yes, while I was a theology student at Oxford I was also not just studying Christian theology but studying Islamic thought as well and a small team of us went to Afghanistan. We ended up going the weekend after the BBC had been in town doing their groundbreaking documentary on the Taliban. We got the opportunity as theological students to interview the Education Minister, the Religion Minister, and the Foreign Minister and the Keeper of the Holy Quran (the Religion Minister). And in the process of that interview in their military headquarters we also gave them Bibles, saying, “We think this is the most precious gift one human being can give another.” And they were all heavily armed, we did wonder what was going to happen next, let’s put it like that, and you could cut the atmosphere with a knife. But the Keeper of the Holy Quran took hold of the Bible and looked at it and he said, “I know exactly what this book is, I’ve been praying to God for years that I could read this book. Thank you for bringing me this book, I’ll read it every day.” And that just struck me as amazing, that at the heart of one of the most violent regimes the world has known, there was someone who was wanting to read the Bible but had never had the opportunity. At the heart of one of the most violent regimes the world has known, there was someone who was wanting to read the Bible but had never had the opportunity. Simon: That is very surprising! 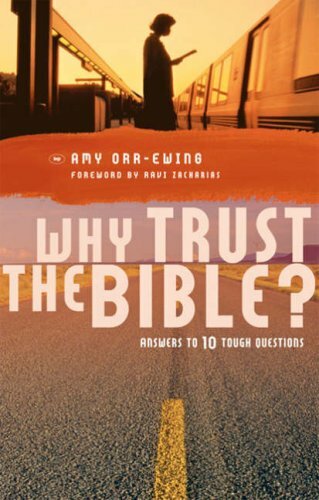 Now Amy, while we might come to accept that the Bible is trustworthy in the way that you’ve described it, is it relevant? I mean, what does the Bible have to say to a complex modern society or even my own life in that place? Amy: My experience is that the Bible has relevance today because it introduces us to the person of Jesus, who came in history, was God incarnate—God making himself known to us in human form—and that truth connects with our reality, the reality of our brokenness, of our anxiety, of our pain, of our sin, of our shame, because in Jesus, God deals with the human condition by going to the cross and offering us forgiveness, offering us new life. It’s interesting to me that the primary image that Jesus used for what it means to come to know God is the image of birth. Now, as a mother of twins and another little boy, it strikes me as odd that a single, 30 something year old, ancient near-eastern male would invoke the image of birth. Birth is overwhelmingly, excruciatingly painful. It’s a visceral struggle for life over death. There’s blood, there’s guts, there’s gore in the process of birth, and Jesus says coming to know God is so real that the image I’m going to use to describe this is: it’s like being born. There was no life and now there is undeniably this screaming baby, there’s life! How much more relevant could things get? God is saying that coming to know him is like being born all over again. This is ontological, this is real, this is visceral, it’s undeniable when this has happened. Jesus says coming to know God is so real that the image I’m going to use to describe this is: it’s like being born. Justine: From the Center for Public Christianity, you’ve been listening to Life & Faith with Justine Toh and Simon Smart. Amy Orr-Ewing joins us again next week to talk about Dorothy L. Sayers, one of the first women to graduate from Oxford and a force to be reckoned with. Amy: She disliked the idea of arguing for women’s equality on the basis of calling women a class. So she’s saying we’re not a special class of human we’re actually human. Justine: You won’t want to miss the conversation. Sign up for our newsletter at PublicChristianity.org or subscribe to our podcast on iTunes—just type “Life & Faith” in the search box to find us. While you’re there, please leave us a rating or a review, we want to know what you think of the show and it helps other people find it as well.